While collectors normally have specific preferences for their cards, most would love to add any authentic Michael Jordan autographed card to their collection. When Michael Jordan made his final return to the NBA in 2001, it gave collectors one last chance to own signed cards from his active playing career. These somewhat overlooked Michael Jordan Washington Wizards autograph cards make for a great option and offer collectors another choice besides his UNC or Chicago Bulls cards. 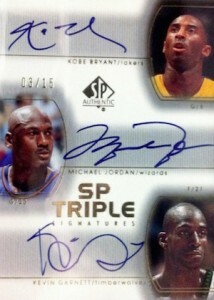 Michael Jordan autographs largely break down into three distinct groups. The earliest cards featured Jordan as a member of the Chicago Bulls and that continued until he returned to the NBA in 2001, following his second retirement. Michael Jordan played for the Washington Wizards during the 2001-02 and 2002-03 seasons, and this is when the bulk of his Washington Wizards autograph cards were released. Once he retired for good, the theme shifted back to the Bulls, but there were several Jordan autographs for the Wizards in 2003-04 products. 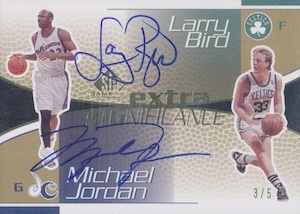 After 2003-04 products, the Chicago Bulls were again the primary focus of Michael Jordan autographs until Panini obtained the sole NBA license starting with 2010-11 products. Since then, Michael Jordan basketball cards have all featured him as a member of the University of North Carolina. 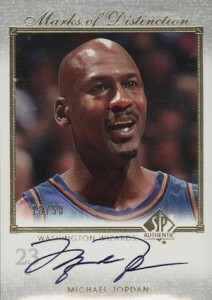 Autographed cards for Michael Jordan as a member of the Washington Wizards are easily the least common. 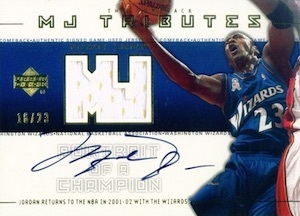 The following guide includes 20 of the top Michael Jordan Washington Wizards autographs of all-time. It is important to note that given the short period of production and overall limited nature, there is not normally an abundance of any one card and some rarely surface. 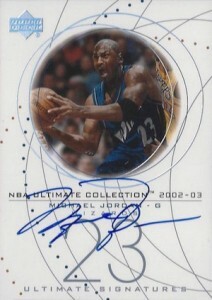 A known print run of 75 makes this autograph one of the most plentiful numbered cards for Michael Jordan as a Wizard. While the on-card signature has ample space to work with, the image of Jordan could have been given a greater focus on the card. 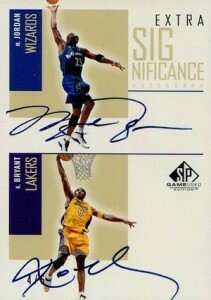 Dual images of Michael Jordan and the design on the signing area give this Ultimate Collection card a distinct look. Also, the gold basketball in Jordan's hand catches the eye. The base version of the 2001-02 card is shown alongside the Gold parallel, which is numbered to 23. 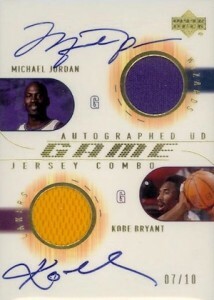 One of the rarest cards on the list, Michael Jordan and Kobe Bryant are paired on this dual autographed jersey card from 2001-02 Upper Deck. The card has added significance now that it has been revealed that Kobe was considering a move to the Wizards to play with MJ. While it is the only card on the list that is not signed on-card, the Fab Floor insert in 2001-02 Upper Deck Honor Roll is still intriguing given that the signature is featured on a court piece that was game-used by Michael Jordan. Part of the six-card Portrait of a Champion insert set that was made available across several 2001-02 UD products, the card below was the only one to include Jordan as a member of the Wizards. Each numbered to 23, these autographed relic cards were originally issued as redemptions. Another autographed jersey option, Player's Club autographs for Michael Jordan were found in the short-lived Upper Deck Playmakers product. 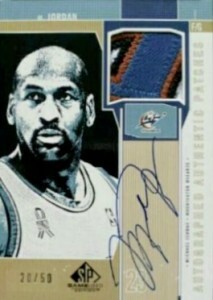 The card shown below features a piece of a shooting shirt worn by Jordan and an on-card autograph. Numbered to 50, this aesthetically pleasing autograph card for Michael Jordan features a large profile shot with a gold foil frame set over the on-card autograph. 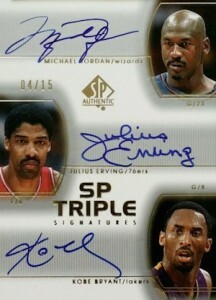 With three all-time greats on one card, SP Triple Signatures will take on added significance once all three are officially named HOF players. Jordan can also be found on another card in the same set that replaces Julius Erving with Kevin Garnett. 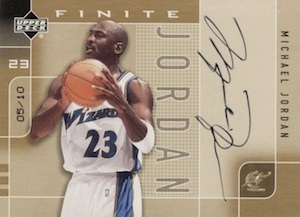 The SIGnificance insert line in 2002-03 SP Game Used brings collectors several Michael Jordan Washington Wizards autographs. The Special Significance design allows for one of the larger Michael Jordan autographs and includes a Gold parallel (#/10) in addition to the base autograph, which is numbered to 50. 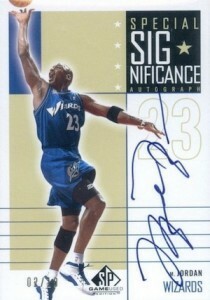 Carrying over the same image from the Special Significance card, Michael Jordan is once again combined with Kobe Bryant. The base version of the Extra Significance card is limited to 25 copies, and the Gold parallel, shown below, is numbered to six. While Kobe Bryant appears to be the most common cardboard counterpart on Michael Jordan cards, Magic Johnson is also included in the set with Michael Jordan. Again, the base card is numbered to 25, and the Gold parallel, shown below, is numbered to six copies. Basically an autographed version of the SP jersey base card for Michael Jordan, the signature on this Washington Wizards card seems a little forced. Still, limited to 25 and featuring an on-card autograph means this card is very popular when it surfaces. Adding a signature to the base Authentic Patches card Michael Jordan card, this limited autographed relic cards stands out, even on this list, thanks to the impressive patch. 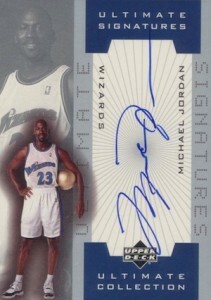 Arguably one of the best card designs of the bunch, the 2002-03 Ultimate Signatures card for Michael Jordan also seems to be one of the most available online. In addition to the base version, which is not numbered, there is a Gold parallel that is hand-numbered to 23. 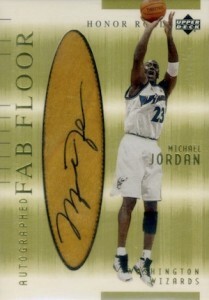 Part of the UD Finite Signatures set, the Michael Jordan card is one of the most short-printed, as most of the other cards in the insert set are numbered to 80 or more. Jordan also signed ten Gold parallels, which is the version shown below. 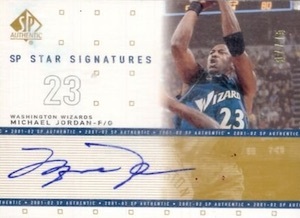 Given the Signature Classics tagline, it is no surprise that the design on this Michael Jordan Washington Wizards autograph has an older feel. The main attribute of the cards is the basketball court that is the canvas for the signature. 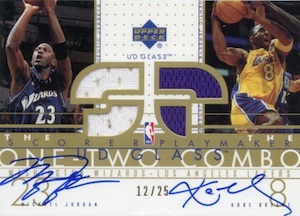 UD Glass was another brand that did not last long, but it did contain some cool cards. The One-Two Combo card below is actually the autographed parallel of the base relic set. The memorabilia card for Kobe Bryant and Michael Jordan is numbered to 125 and the autographed version only has 25 copies. 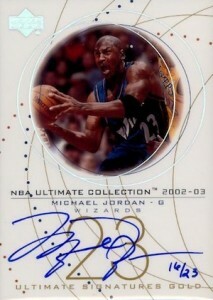 Also available in 2002-03 UD Glass, the image does not do the Michael Jordan acetate box topper justice. While the base Magnifying Glass toppers were found one per box, only 1:6 boxes yielded a signed parallel. 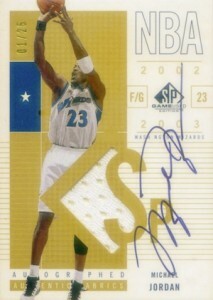 This Michael Jordan Washington Wizards autograph is not numbered, but the print run was revealed to be only 23 copies. 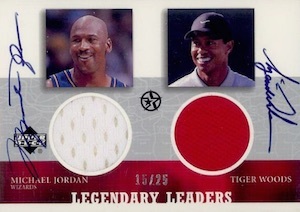 Michael Jordan and Tiger Woods have several signed cards that they share together, but this was the very first autographed card for the twosome. Featuring event-worn relic pieces and on-card autographs, the Legendary Leaders card is rarely seen. Larry Bird and Michael Jordan had many NBA battles during their career, but Jordan was wearing a different jersey at the time. 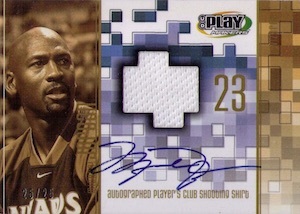 The two NBA superstars are combined on the Extra Significance insert in 2003-04 SP Game Used. The base version is numbered to 25 and the Gold parallel below is numbered to five. Great read! Had no idea he had that many autos in the Wizards jersey.